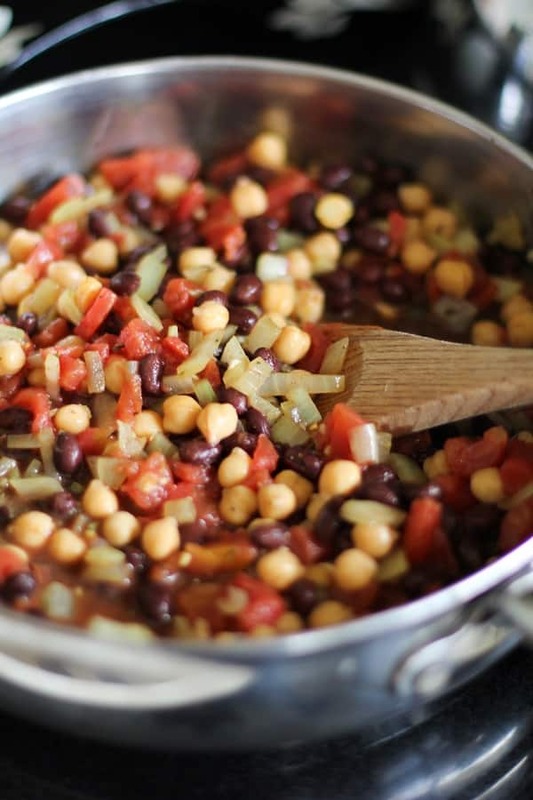 Jamaican Chickpea Stew - A Vegan Recipe from Oh My Veggies! Having grown up in an area where there are more ethnic food restaurants than American-style restaurants, I’ve had an interest in international cooking ever since I knew how to sauté an onion. While a typical teenager would frequent burger or pizza joints, my friends and I made the rounds at our local Thai, Japanese, Mexican, and Indian restaurants. As a result, I’m always excited at the prospect of cooking up new-to-me food. When I saw Cooking Light’s recipe for Jamaican Chicken Stew, I instantly knew I wanted to give a meatless version a shot. To me, there is nothing more satisfying than a flavorful stew served over hot brown rice. Plus, I was eager to learn about another international cuisine. So I fired up the ol’ Google and learned all about Jamaican food. Along with its beautiful beaches, Jamaica is known for its vibrant and flavorful food. Jamaican cuisine is influenced by a number of other countries and continents, including Spain, Africa, England, India, China, and France. A typical main dish includes spiced seafood or chicken with rice and beans or peas. Curries and stews made with flavorful spices are commonplace, and fried plantains are normally served alongside. Beverages are just as fun as the food, as Jamaicans are famous for their fresh fruit juices, ginger beer, homemade sodas, and let’s not forget: rum! 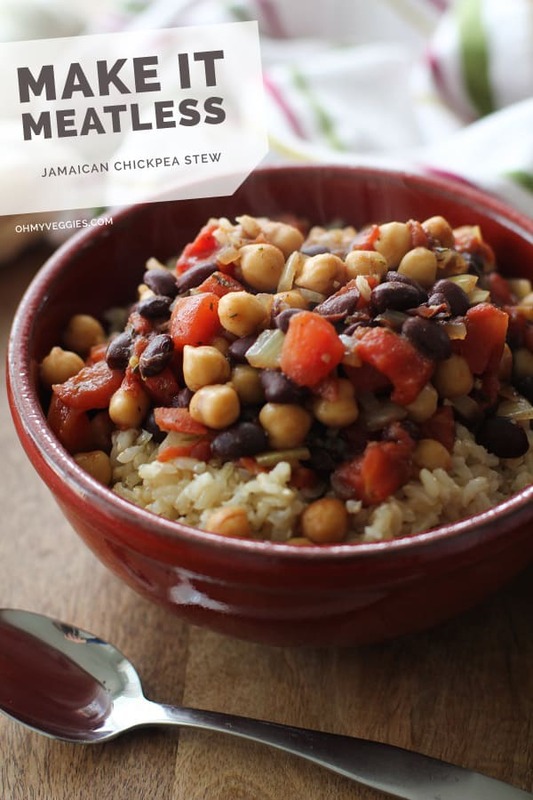 This recipe incorporates many of the typical flavors used in Jamaican cooking, but instead of using chicken for the stew, I made it meatless by adding a can of chickpeas. I also omitted the capers from the inspiration recipe because I didn’t have any on hand, and I knew the stew would be flavorful enough without them. I was amazed by how easy this Jamaican Chickpea Stew was to make. 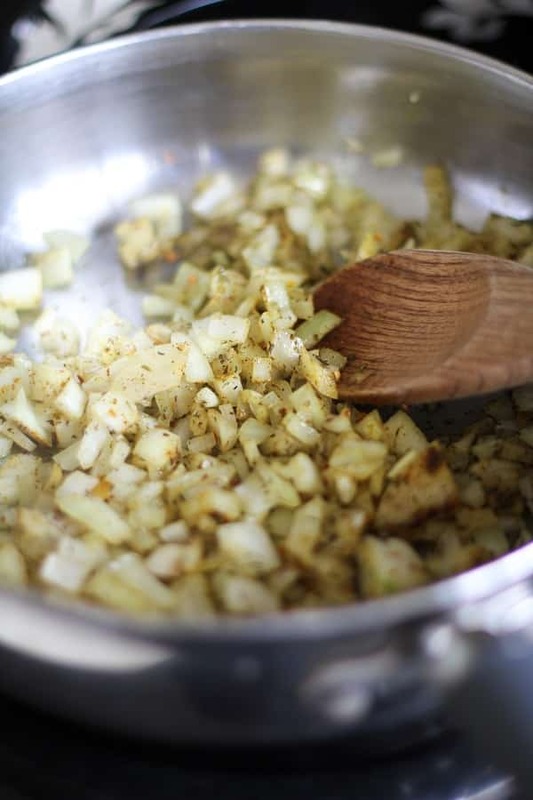 It requires just two steps: sauté the onion with the spices, then simmer with the remaining ingredients for 15 minutes. Plus, the ingredients list is super simple. Between your spice cabinet and your pantry, I’m willing to bet you already have all of the ingredients on hand to do dinner island-style. This simple, spicy, and satisfying vegetarian stew takes only 20 minutes to whip up. Inspired by Cooking Light’s Jamaican Chicken Stew. Heat the olive oil in a large skillet over medium-high heat. Add the onion and garlic and sauté until the onion is translucent, about 5 minutes. Add the curry powder, thyme, allspice, red pepper flakes, and salt; cook until fragrant, about 30 seconds. Stir in the red wine, black beans, chickpeas, and tomatoes. Bring to a full boil, then reduce the heat to medium low and simmer, uncovered, for 15 minutes. Taste and add additional salt if desired. Serve over brown rice. Preparation tip: If your rice isn’t already cooked, start it about 15 minutes before you make the stew. It should be ready right about the same time the stew is! Love these flavors and spices! Thanks, Liz! The spices really do make the meal so inviting. We honeymooned in Jamaica, so anything Jamaican flavored holds a very special place in my heart. Will try this for Meatless Monday for sure! I’d give anything to jump on a plane and GO to Jamaica right this second, but since that’s not an option this stew will do very nicely in the meantime. Looks so full of flavor and hearty! Look wonderful! And I have a post of chickpeas on the stove right now! I grew up on Jamaican food daily and I crave meatless versions of my favorites partially because I eat very little meat and partially because I don’t have time to do that type of Jamaican cooking so thanks for posting this! I would add that having good quality yellow curry will make all the difference in having this taste authentic. And if you really like spicy, get your hand on a scotch bonnet pepper and I bet it would taste divine subbed in for the red pepper flakes. None of the spices in this speaks Jamaican…there’s no scotch bonnet pepper, thyme, escallion, pimento…nothing that we Jamaicans cook with. Tried it as the recipe says but it was bland.. Thanks for your feedback, Lala, and I’m sorry you didn’t like the recipe. I’ve never come across scotch bonnet peppers or pimentos at my grocery store and figured our readers could add more red pepper flakes to their desired heat level. I figured if my grocery store doesn’t carry them, our readers would have difficulty finding them as well. It can be difficult to make completely authentic ethnic food under ingredient restrictions, but we still like our readers to get a taste for other cuisines 🙂 Thanks again and I’ll be sure to track down more Jamaican ingredients for my next go-round. There’s so much flavor happening in this dish. Love it! So glad you like it, Jennie! I love chickpeas! Glad to add another great recipe to my collection! Aren’t chickpeas the best? They liven up any meal in my opinion. Plus they’re so great for you! Glad you like the recipe, Ami! So many great flavours in the stew! Looks delicious! I love a quick one-pot dinner. This would be amazing over rice cooked in coconut milk. Awesome recipe! This stew looks amazing and so comforting, plus I’ve never experimented with Jamaican cousin and now I can’t wait to learn more about it and try out some of their typical dishes! You got it, Elisa! I’m excited to dive into more Jamaican recipes, myself 🙂 Hope you enjoy the recipe! Jamaican cuisine can be really fun! This stew looks yummy, I will probably add some scotch bonnets to up the spice factor and make it more true to the traditional jerk seasoning. I will also probably cook the brown rice in coconut milk. Looking forward to trying this, I have never thought of replacing chicken with chickpeas. I think I will like it, and it seems so easy! Africa is a continent. Not a country. Just make the Jamaican chickpea stew & love it! Oh good! I’m so happy to hear you enjoyed the stew, Lisa and thanks so much for letting us know! This sounds good. I have been experimenting with chick peas and can’t wait to try this. I noticed someone else made mention to the other spices that Jamaicans cook with. As a Jamaican, I can say yes that is true, but it is not necessary as those spices are mostly used on meat to bring out the flavour. A pinch of salt can go a long way to bring out the desired flavours. Scotch bonnet is very hot, so if you don’t know how to use it, the experience can be unpleasant. Please note that not all Jamaicans love “heat”. Thanks so much for your input, Nicky. I figured the scotch bonnet peppers would be a stretch for most people who aren’t accustomed to spicy cuisine, too – plus, I’ve never seen one in person, although I would love to try cooking with them. I’m with ya – salt + a variety of spices always seems to work wonders on a meal. I’m glad you’re excited to try the dish and can’t wait to hear what you think! Have a wonderful weekend! This sounds wonderful! It looks like a hearty dish our whole family would enjoy. My 6 year old is a huge fan of chickpeas. Being Jamaica, living in Jamaica, I’m impressed! Not only does this stew look delicious, you got all the Jamaican facts right, especially the rum 🙂 haha! Yaaaay, thanks, Jessica! I’m glad you enjoyed the post and I appreciate you letting me know my facts check out, ha! One of these days, I’ll head over to Jamaica, myself and enjoy some authentic cuisine and all that rum. sluuurp! Hope you have a wonderful weekend. I love the big bold flavors of Jamaican food, but always thought it was over for me when I went veg. Obviously NOT. Love how you’ve veg-ed up this recipe! Thanks, my dear! I’m happy I could oblige. Now let’s make some Jamaican food and eat all them beans! I made this for the first time and its incredible! I didnt have any garbanzo beans on hand so i substituted a can of kidney beans and it worked great. I’ll be making this again soon! Thanks! I made this last night and thoroughly enjoyed it! My non-vegetarian parents loved it too. Tastes great topped with greek yoghurt. I will definitely be making it again. My mom is Jamaican and hasn’t heard of any dish like this before. I wouldn’t call it Jamaican but it does look delicious! !